This is one of my favorite dishes of all time. I literally can live off of eating this stuff, and I would eat bowls and bowls of it when I had a faster metabolism. With my dad being Cantonese, I was able to try a myriade of wonderful Canto cuisine, but this vies with dim sum for the top spot. marinate the beef with the light and dark soy sauce, rice wine, sesame oil, oyster sauce, salt and pepper. lightly dust the meat with the corn starch and mix. leave to marinade for about half an hour. heat vegetable oil in a frying pan or wok over medium heat. add onions and cook until they begin to soften. add the meat and stir to break up and mix with onions. cook until meat is almost done. add frozen peas and continue to cook until meat is done and peas are cooked. if you like having a bit of a gravy, you can add a cornstarch water mixture and simmer it until it reaches the desired consistency. 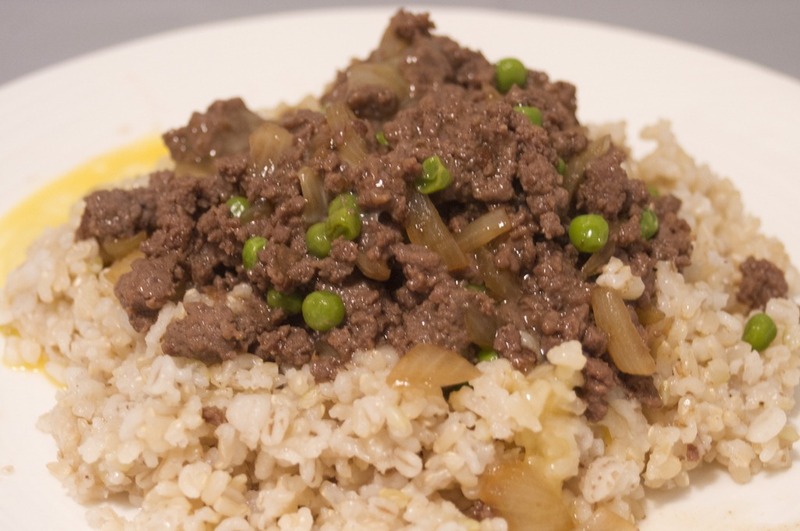 serve over hot rice and pour the beaten egg mixture over the beef. the eggs should cook from the heat of the rice and beef, but if you prefer not to eat the eggs this way, you can pan fry an egg separately so that the yolk is still runny and top the dish with this. Then mix. There have been many comments on making the beef more tender by adding about 1/2 tsp of baking soda or a bit of the egg mixture to the meat while marinating, but I didn’t have baking soda and don’t like if the egg is cooked before serving on the dish so I wasn’t able to try either of these methods, but I may next time. I didn’t have any problems with the tenderness of the beef, but then again, it may apply to the variations that involve sliced beef rather than minced/ground. I searched all over the internet for this recipe, but was only able to find approximations and estimations of proportions and directions so I decided to gather what I could from this and wing it. It turned out pretty dang good, not exactly the same as my restaurant experiences, but it was delicious and matched the essential flavors. bro thanks for the ingredients, ive tried it and it tasted good! Thanks for sharing, I did the egg omelette style but while half cooked and still runny I put it on top of beef and rice. My family loves it! Just made it and it was so good! I made this for dinner tonight. I was missing oyster sauce and had to substitute it, but it still turned out delicious. Thank you so much.